Commonly known as turmeric, turmeric and curcumin. This root is highly revered in Ayurvedic medicine, as well as general South Asian cuisine. Native to Southern Asia, the name curcuma comes from the Arabic word “kurkum”, or “saffron”, and is an indication of its relationship to the vibrant orange color of both herbs. Since Biblical times, turmeric has been used to spice foods, make perfume and color clothing. Perennial that re-shoots every spring. Turmeric prefers warm direct or indirect sun. of cancers. Unless you live in the tropics, where it can be planted anytime, plant in late spring. Fresh roots can be planted directly into soil. The dried rhizome of turmeric can be used in subsequent plantings. Turmeric shoots appear in about two months from planting. The rhizomes can usually be harvested from seven to ten months after planting, when leaves and stems become dry. When the plant has changed from abundant green to dry, dig up the entire plant, ensuring that you dig up the entire root (as this is the part that is used medicinally). 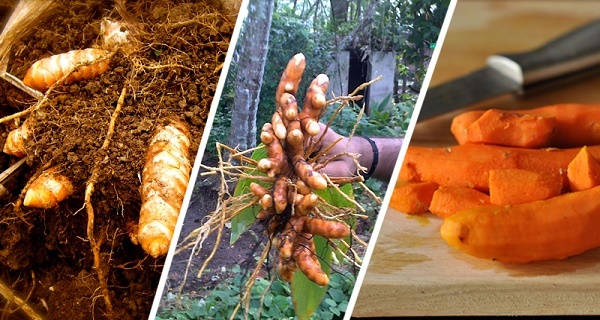 Plan to harvest your turmeric root at the end of the summer growing season. Drying turmeric is a fairly complicated process. First you must boil the roots, then leave in the sun to dry, or use a dehydrator. The plant may also be used fresh and raw in a grated form. Approximately 700 grams of fresh root yields per plant. Store fresh roots in the refrigerator, as you would fresh ginger. Dried, the root can be made into a powder and stored in an airtight container. The essential oil is excellent for skin conditions, bruises, sprains, fungal infections, Athlete’s foot and muscular aches. Turmeric’s main active chemical component is a phenolic curcuminoid. It also contains immune boosting polysaccharides. No contraindications have been seen, but avoid if you are pregnant, as turmeric has been associated with stimulating menstruation and possibly, but rarely, inducing abortion. Avoid taking turmeric when taking drugs related to diabetes (that lower blood sugar). Here’s some tips on how to grow Turmeric easily at home. For more, please visit DailyHealthPost. Turmeric takes between 8 to 10 months for the edible rhizomes to mature. While the leaves and stems are edible, most people harvest turmeric only for its roots. Most herbs can be harvested throughout the growing season, but turmeric root is best if harvested all at once when mature. When the rhizomes are large enough, dig up all rhizomes from the pot. They are best if all harvested at once. Dig up the rhizomes and save a few pieces to plant for the following season. Make sure to change the soil, though, because the original plant probably depleted it of all its nutrients. Turmeric roots should be kept in a cool, dry place until use. Boil the roots for 45 minutes. Dry the turmeric for approximately one week. Wearing gloves to prevent dying your hands bright yellow, peel the roots. Grind the peeled rhizomes into the lovely spice that is used in so many recipes.